Perth Mint’s Lunar Series II collection has reached its penultimate release in 2018 as the Year of the Dog descends upon the Lunar Calendar. There are a total of 12 animals on the Zodiac, and the Lunar Series II collection captures each one on beautiful silver and gold coins. 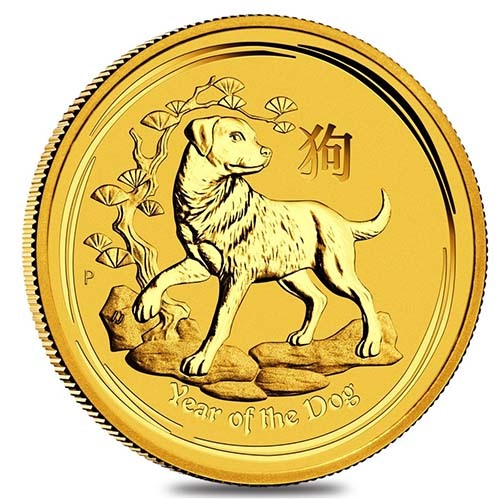 The latest Year of the Dog design in the gold release features a Labrador Retriever. Today, 2018 1 oz Gold Australian Dog Coins are available to you online at Silver.com. Eleventh coin design for the Lunar Series II collection! Consists of Two Troy ounces of .9999 fine gold in BU condition. Reverse features a Labrador Retriever. Designs on reverse from Ing Ing Jong. Artist Ing Ing Jong joined the Perth Mint as a coin designer in 2011, and began designing the images for the Lunar Series II collection starting in 2013. Her life’s work prior to this came as an illustrator and she has an admiration for Disney illustrators who were always able to convey human emotions through character designs with ease. 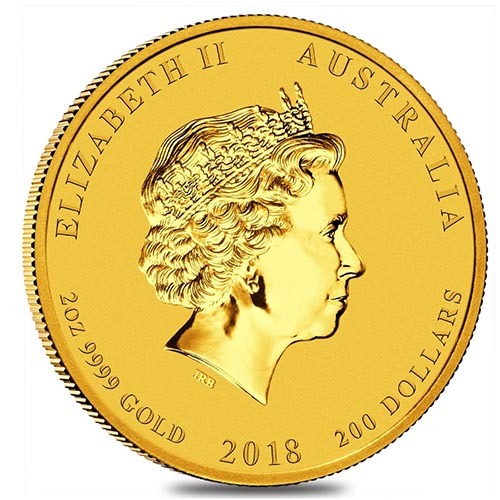 Your 2018 2 oz Gold Australian Dog Coin is available for purchase in BU condition. Coins in BU condition have no signs of wear and tear, though minor flaws such as breaks in the luster, spotted surfaces, and contact marks are possible. These result not from handling, but instead from the production process. Labrador Retrievers are the Year of the Dog representative on 2018 Gold Australian Dog coinage. The Lab, as it’s affectionately known, is a gun-retriever dog often used by hunters. However, their character traits also make them very obedient and loyal service dogs for the elderly, the blind, and those with disabilities. The reverse of the 2018 2 oz Gold Australian Dog Coins features the Labrador Retriever as it stands on an outcrop of rocks. The background features a stylized pine tree in the image, and engravings include “Year of the Dog,” the Chinese character for dog, and the Perth Mint’s “P” mint mark. On the obverse of all Gold Australian Dog Coins is the portrait of Queen Elizabeth II. Her Majesty is captured in right-profile relief in this fourth-generation effigy from Ian Rank-Broadley which was created in 1998. The Perth Mint was originally a British Royal Mint facility in Australia, and today is owned by the state of Western Australia. It operates independent of the Royal Australian Mint in Canberra, and has legal tender status for its coins through the Currency Act of 1965. Please feel free to contact Silver.com at 888-989-7223, chat with us live online, or simply send us an email with your questions. Don’t forget to check our gold price per ounce tracker throughout the day!